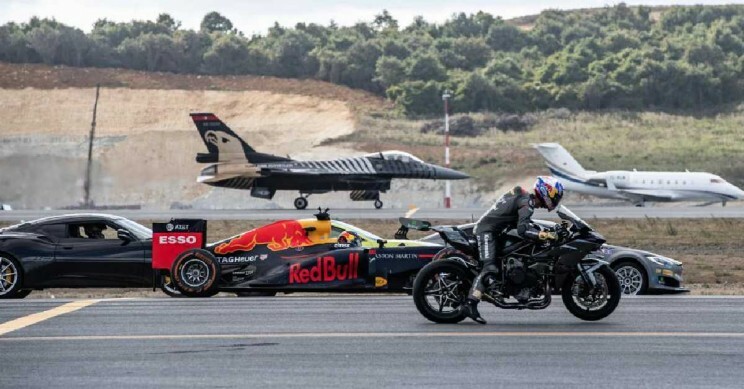 A Supercar, A Superbike & A Jet Race…Who Wins? If you ever wanted to know who would win a race between a supercar, superbike, an FI car, a fighter jet and a private jet, we have the answer. During Istanbul Teknofest, a group of high-powered machine drivers and pilots decided to test their speed skills on a flat strip of asphalt and determine who reigned supreme. The aviation, space and technology event took place at the Turkish city’s international airport. The competitors included a Kawasaki Ninja H2R motorcycle, a Tesla P100DL, an Aston Martin New Vantage and a Lotus Evora GT 430, reports Interesting Engineering. Oh, and there was also a fighter jet (capable of reaching speeds of 1,500 mph) and a private jet in the mix. The race was a must-see spectacle (check it out here on YouTube). Each vehicle lined up on the runway and waited for the go signal. With cameras in the cockpits and on helmets, viewers got an up close and personal view of the action. Initially, the formula one racer took the lead (having a lightweight body and sticky tires accounted for the quick start). But shortly after, former pro motorcycle racer and Turkish parliamentarian Kenan Sofuoghu caught up and blew away his rivals with his Kawasaki’s four-cylinder supercharged engine. The superbike faced a bit of competition from the F1 but managed to hold on to the top spot for the rest of the race. The power to weight ratio on a short track gave the motorcycle a distinct advantage. The F-16 Solo Turk had a slow start, but the fighter jet managed to snag third place. It’s worth noting that while jets fly at really high speeds, they aren’t exactly known for their super-fast taxiing skills. Plus, the race only covered 400 meters, giving the jet a distinct disadvantage. Had the race been longer, the jet obviously would have dominated. The Tesla (driven by Swedish Touring Car Championship racer Emma Kimilainen) came in fourth place. Rally driver Yagiz Avci drove the Aston Martin New Vantage, and Superstock racer Toprak Razgatlioglu drove the Lotus Evora GT 430. Interested in acquiring a Ninja H2R? They cost around US$55,000 and feature a 4-stroke, 4-cylinder, liquid-cooled, supercharged engine. The track-only bike has 310 horsepower (or 326 HP with ram air) and is considered the fastest production motorcycle on the market. It is 50 percent more powerful than the fastest street-legal motorcycles.